Commemorating high achievers in vehicle safety for the ASEAN region, the New Car Assessment Program for Southeast Asian Countries (ASEAN NCAP) held its third bi-annual awards ceremony, the ASEAN NCAP Grand Prix 2018, at Karawang in West Java, Indonesia. Toyota bagged four awards at the occasion which includes ASEAN NCAP Excellence Award for the Most 5 Star Brand (2017-2018), ASEAN NCAP Excellence Award- Continuous Safety Improvement for the Toyota Vios and the Toyota Rush and the Best Adult Occupant Protection Award for the Toyota C-HR. The ASEAN NCAP Grand Prix commemorates the achievement of vehicles that have participated in the ASEAN NCAP assessment over the last two years. Recognising its excellent standards for safety, Toyota was presented with the Most 5 Star Brand Award (2017-2018) for its efforts at enhancing safety standards in the ASEAN region with its vehicles. Toyota is the only brand to have received the highest number of 5-Star vehicle safety rating in evaluations conducted by the ASEAN NCAP in 2017-2018. The Toyota Vios & the Toyota Rush were presented with the ASEAN NCAP Excellence Award of Continuous Safety Improvement. The previous generation models of both the Vios and the Rush had received 4 stars. However, with the addition of new and enhanced safety features, both the Vios and the Rush have been able to receive 5-star rating from ASEAN NCAP in the year 2017 and 2018, respectively. This achievement stands a true testimony to Toyota’s continuous efforts to improve the occupant protection and associated safety standards offered in the vehicles. The Toyota C-HR was also presented with an award for the Best Adult Occupant Protection among all other vehicles evaluated by ASEAN NCAP in 2017-2018. This evaluation is based on frontal and side crash tests conducted by ASEAN NCAP on vehicles which are fitted with crash test dummies that represent adult occupants. During the crash test, the damage sustained by the vehicle and the crash test dummies are carefully assessed and quantified. This assessment is then translated into a numerical score. Based on this, the vehicle with the highest score is awarded the Best Adult Occupant Protection (AOP). Toyota is proud to achieve these awards from ASEAN NCAP and will continue to work with its stakeholders in the ASEAN region. Toyota considers safety as one of its top priorities. Be it vehicle safety or road safety, Toyota is fully aware that safety does not rely solely on the quality of vehicles on the road but on a host of other interrelated components of road traffic safety as well. 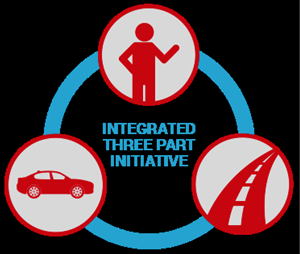 Toyota’s holistic view to safety stems from its Integrated Three-Part Initiative: Vehicles, People & Traffic Environment. In terms of vehicle safety, Toyota has been developing safety features and conducting extensive R&D which involves crash tests and simulations on its own, and then analysing the results to continually enhance its safety features. In addition to that, Toyota has also been raising public awareness about safety in the region. To take its commitment to safety a step further, with its first ever global corporate initiative, Start Your Impossible (SYI), Toyota is working towards its ultimate goal of zero traffic fatality. It is through these initiatives that Toyota is committed to achieving a safer, more sustainable and mobile world for everyone. In India with Yaris, Toyota Kirloskar Motor [TKM] has underpinned commitment to safety by being the first in the segment to offer 7 SRS airbags – (D+P airbags, Side airbags, Curtain Shield Airbags (CSA) and knee airbag) across all variants in the new Yaris. Loaded with other best- in-class safety features such as Anti-Lock Braking System (ABS) with Electronic Brake Distribution (EBD), Vehicle Stability Control, Hill Start Assist control, Front & Rear Parking Sensors, Disc Brakes on all 4 wheels, Tire Pressure Monitoring System & ISOFIX Child Seats, yet again set new safety benchmark in the Indian car industry. Testament to its unbeaten safety features, Toyota Yaris recently received 5-star safety ratings from the New Car Assessment Program for Southeast Asian Countries (ASEAN NCAP). The Made-in India Etios bagged 4-Stars at a crash test campaign organized by Global NCAP the international body that is involved in new car assessment in association with AA South Africa in 2017. It has also been recognized as “Most Dependable Car” in the Entry Mid-Size Segment award by JD Power 2017 India Vehicle Dependability study, for three consecutive years. Aligning with Toyota’s global philosophy - Toyota Kirloskar Motor being a Safety Leader, have implemented various safety initiatives by engaging with our stakeholders – Employees, Dealers partners & Supplier partners through a 3-dimension concept of Manufacturing Safe Cars, Developing Safe Drivers & Building Safer Environment.